In the heart of Scotland, with nearby castles, golf, adventure activities, fishing, hiking, cycling - and even skiing! Dalguise is just 6 miles North of Dunkeld, in Perthshire, Scotland. The Kirk is just over an hour's drive from Edinburgh airport and the nearest train station is Dunkeld. Perth is about 25 minutes South. Glasgow is an hour and a half's drive. The nearest shops, pubs and restaurants are in Dunkeld. This includes a Coop with generous opening hours. Nearby Perth has large Asda, Tesco, Aldi, Lidl. Tesco delivers to the Old Kirk. 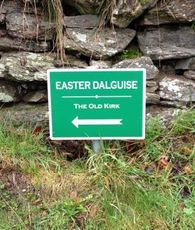 Look out for this sign for the private road up to the Old Kirk!